On Tuesday, South Africa’s prosecutions head Shaun Abrahams again contorted himself through a media briefing attempting to explain that there has been no political interference in his decision to charge finance minister Pravin Gordhan. The charges relate to the establishment of an investigative unit within the South African Revenue Service (SARS) in 2007, as well as the early retirement of Ivan Pillay, a deputy commissioner of SARS at that time. The rule of law of course demands that no one should be above the law, yet one cannot fail to question the timing and circumstances surrounding this matter. The news of Gordhan being charged comes against the backdrop of two significant developments relating to President Jacob Zuma himself. The Constitutional Court ruled this past week that it was unable to hear the misguided appeal by the National Prosecuting Authority (NPA) against an earlier high court decision that the 783 charges of fraud, corruption and money laundering against Zuma should be pursued. Why has Abrahams gone to such great lengths to appeal the matter and why is Zuma not simply charged, given the overwhelming evidence that he should be? At the same time this past week, outgoing Public Protector Thuli Madonsela, who started an investigation into allegations of ‘state capture’, was given the cold shoulder by Zuma’s delaying tactics. Curiously, Zuma has also requested Madonsela not to finalise her investigation before her term ends, as he needs an opportunity to question his cabinet ministers about the issue. Zuma seems rather confident that incoming Public Protector Busisiwe Mkhwebane might not show the same enthusiasm to continue this investigation. It certainly does not behove the president to disclose his relationship with the Gupta family or any other connections for that matter. But the process has been started and Mkhwebane has already hinted that this particular investigation will not be at the top of her agenda. Her office will need to be closely scrutinised in the months to come. But back to Gordhan. Much ink has been spilled on the matter of what exactly is going on. There is a possible answer that might simplify matters. It goes something like this: Gordhan and the relatively powerful Team Treasury have been hard at work overseeing South Africa’s macro-economic stability and ensuring that the ratings agency downgrades are kept at bay. 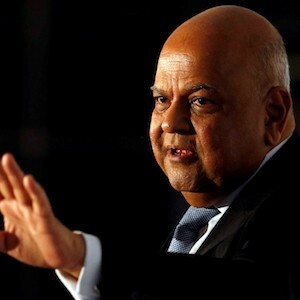 Most economists will say that they have already ‘factored in’ a downgrade but be that as it may, Gordhan has been preaching fiscal discipline and has been firm that government expenditure has to be cut. Just last week he was in Washington DC at the annual International Monetary Fund meetings making the case for South Africa cogently and effectively. Gordhan, his deputy Mcebisi Jonas and National Treasury have held the line against a maverick and dangerous populism within the ANC and from Zuma himself. Removing Gordhan or pressuring him to resign would enable someone more pliable to be appointed, thus allowing Zuma free rein over state owned enterprises and related contracts worth billions. For example, the appointment of Hlaudi Motsoeneng to head the South African Broadcasting Cooperation (SABC) has drawn widespread criticism. A staunch Zuma supporter, Motsoeneng was found by the Public Protector to have committed fraud and to be unfit for the job. The SABC lost over R400 million in the last financial year and is kept afloat by government grants of over R5 billion. In another case, a multi-billion rand nuclear deal is being pushed through behind closed doors by another Zuma loyalist and Minister for Energy Affairs, Tina Joemat-Pettersson, who has also been found wanting by the Public Protector. Zuma is now clearly fighting back despite the credit ratings agencies hovering and the mini-budget coming up later this month. History has shown that Zuma is willing to manipulate state institutions to ensure that his interests are protected. It is for this reason that his personal attorney Michael Hulley plays such an important role in Zuma’s many legal matters as opposed to the president relying on State Attorneys. This probably also explains why Zuma appointed Berning Ntlemeza as head of the police’s Hawks investigative unit after Police Minister Nathi Nhleko illegally forced out previous Hawks head Anwar Dramat reportedly for investigating sensitive corruption cases involving powerful political interests. It is worth repeating that Ntlemeza is the same person the North Gauteng High court found to be unfit to hold his position. In fact, Justice Matonjane said Ntlemeza was ‘biased, dishonest and lacks integrity and honour’, and found that he made false statements under oath. In his inability to deal with the 700-plus charges against Zuma himself, Abrahams has shown, by charging Gordhan, that he is willing to stave off political pressure by doing what is expedient. Will Zuma now reshuffle his cabinet and fire Gordhan because he operates ‘under a cloud’? Or will Gordhan be able to carry on once more, backed by parts of the ANC, civil society and business? In December 2015 we asked whether Zuma would survive his firing of Nene. In August we asked whether he would survive the ANC’s bloody nose at the polls, and of course we’ve asked repeatedly whether he would survive the Nkandla scandal. And true to form, in this post-truth world, Zuma survived. His firing of Nene was an act of calculated daring then and the rand went into free-fall. Something similar is bound to happen in the coming days but there is nothing to suggest that Zuma is worried about the consequences. This is, to coin the cliché, endgame politics. The ANC itself now faces a crucial decision: recall Zuma or watch the situation spiral completely out of its control. Nothing however indicates that the party is even remotely prepared for what it must do to save our country from the ruinous consequences of this latest move. A version of this article first appeared in Daily Maverick.